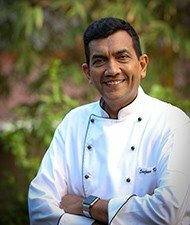 Gold Leaf Banquets is an upscale Banqueting Service launched by award winning Master Chef Sanjeev Kapoor in collaboration with award winning Asian Chef Milind Sovani. Gold Leaf brings you the unique opportunity where top celebrity chefs like Asha Khatau and Zeba Kohli come together to design special menus to make your event a truly memorable one. What our master chefs would do is, sit down with you and have a detailed chat to understand your unique needs. Based on that, they will create a designer menu to be served exclusively at your function, of dishes never served before. Gold Leaf experts can even customize Bespoke Menus with signature dishes based on your preferences and requirements. You have a choice of any of our celebrity chefs to handcraft an entire menu with signature dishes. Besides, you can even ask them to design a special gourmet corner for your function. The creation of every menu is personally overseen by Chef Milind Sovani, and every event is managed by a team of chefs and managers certified by Chef Sanjeev Kapoor and Chef Milind Sovani.